We have a new colouring book out – but this one is a little different, for every sale in the UK. £1 will go to the Rethink mental health charity. It is a mindful colouring book, so we thought; why not try and help one download at a time. All for the price of a coffee (£2.99). Mental health issues affect 1 in 3 people in the UK, and it is estimated that 1.1Bn (yes you heard that right) people globally have some form of mental health issue. There are only 7.7Bn people in the world, so that is 1 in 7. That is an awful lot of people that need help. The trend to colour isn’t new to help with mental wellbeing. It almost feels as old as the hills, but that doesn’t make it any less effective. My brother has schizophrenia, and I bought him a colouring book when he was in hospital. I’d like to think it helped. So for me, it made sense given what resources KiddyCharts has, to create something myself. Something that might help others too. The mental health of our kids is something that there isn’t enough conversation about either, so we decided to create a colouring book that helped both kids AND adults to be mindful. 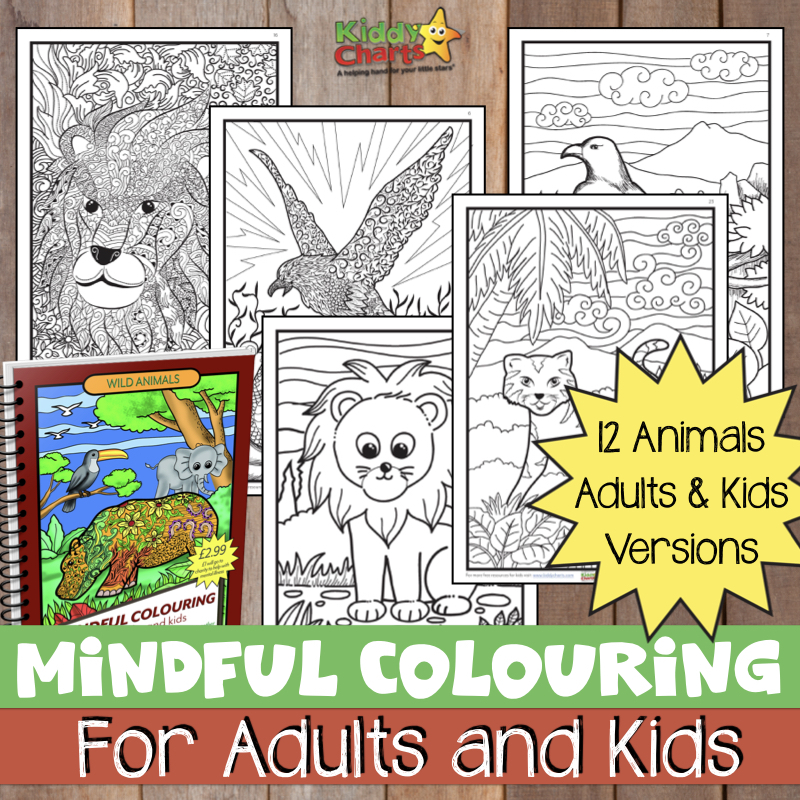 Another page with the same animal – this mindful colouring page has another design, but this time much more intricate, with beautiful and delicate patterns for adults, or older children to colour in. We really hope that parents, siblings, and their younger children can sit down and colour these pictures today, together. As you can see – we have a grand total of 12 pairs of animals for you to sit down and colour together. We hope you love this resource – it is only £2.99 – and that is just the price of a coffee. Not so much when £1 of that goes to a worthy cause (UK Only). So come along – help out today, and get yourself a fabulous colouring book at the same time too. If you like the content that we produce on this site, and we do have some amazing free resources, as well as this rather fabulous book, do sign up to our newsletter. We produce the newsletter once a week covering all the new printables and articles that we have on the site. You can also sign up to it daily if you choose to. Thanks, as always, for coming to visit us. If you don’t fancy buying this now – why not pin it for later using the image below? You are doing beautiful work and also you are a very fine artist. Kids would sure love this artbook because this book is also a fun activity. This is such a fab idea! I love colouring, I find it so relaxing. I also suffer with my mental health so it’s win win for me. I think that’s a wonderful idea and wish you all the best with this project! These colouring books are amazing. I’ve actually seen many more adults with these books than children. They provide a way to express yourself and some say it helps to lower stress! Great post and way to raise money! Thanks for sharing, will look into these! I love the sound of these mindful colouring books. I would love one for myself. Think I need it. Colouring books are fun and will definitely help those, especially children, with mental health issues. They can do interesting activities to stimulate brain activity.